I sing tenor in my church Choir. 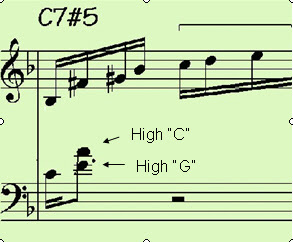 I consider myself lucky to reach the high G. But when ever I see my favourite singer reach the higher C (Three full notes higher than G) , I experience Goosebumps. A week back he passed away due to cancer. 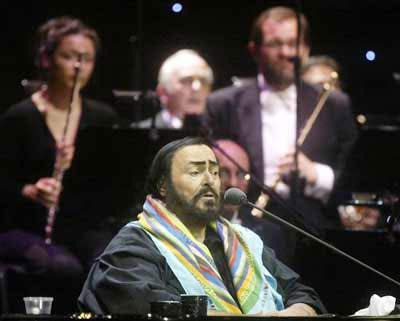 This post is a tribute for the most celebrated Tenor of this century," Luciano Pavarotti ". He mesmerised packed audience with his powerful voice. ''Nessun Dorma'' was Pavarotti's last performance, sung at the opening ceremony of the Winter Olympics in Turin, Italy, in February 2006. There won't be anymore three tenors. 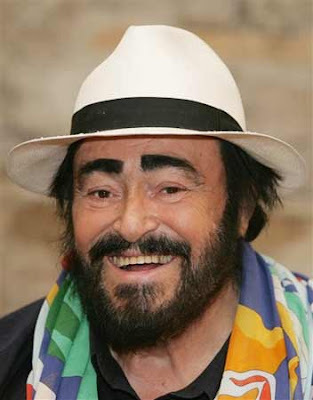 The smile, the vibrations produced by Pavarotti,Placido Domingo and Jose Carreras would never be seen again.His thick black beard and the smart tuxedo that very finely wraps his pot belly are visions that would last forever among his fans. The nine consecutive high Cs he reached in a stage performance with the three tenors left him bleeding.Such a performance could never be seen ever. Though there were professional jealousy between the three tenors, pavarotti always compared him with himself. I love tenor now, more than ever. If there is a High C in you, it will surely come out there. Have listened to Enrico Caruso's.. never Pavarotti's..
Will check out some of his.. And btw, cool blog.. If keeping your throats hauled at a high note on a persistent rate and retainging the chord is good singing, then yes, Pavarotti sang !! But man, how can you call THAT singing !! am not aware of Christian rock.. but i do love music of varying genres! and i love people who love music! so thumbs up.. and keep going!